One of my favorite things about our recent Hawaii trip was filming some of the world’s best surfers taking on the Banzai Pipeline. 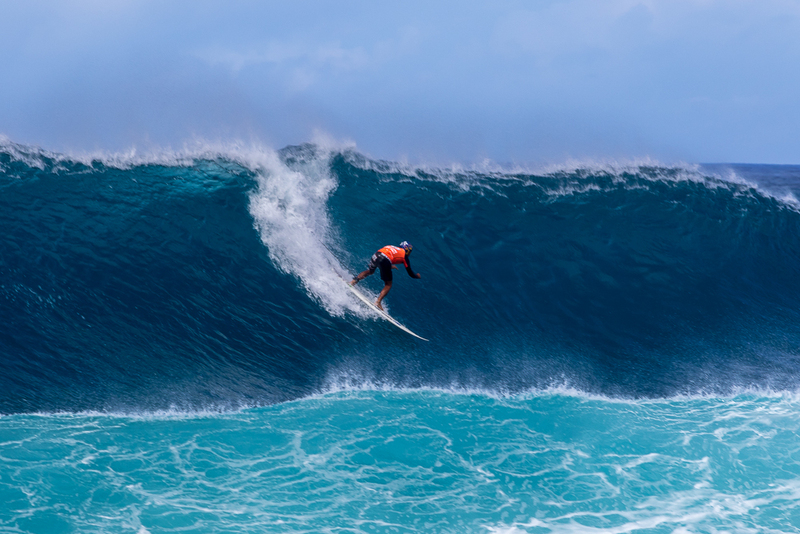 Located on the North Shore of Oahu, the Banzai Pipeline is one of the world’s most famous–and dangerous–surfing spots. During our visit, some amazing riders were confronting the beast as part of the 2018 Volcom Pipe Pro. The surf break is known around the world for its tube-like formation, caused by a series of reefs near the shore (see video at bottom of post for an explanation). We were definitely impressed by the size of the waves, especially on the second day that we visited. There was a high surf advisory that afternoon and the waves were monsters. The shot below isn’t one of the competitors–it’s just some guy surfing nearby–but it should give you an idea of how big the waves were. I’m not a surfer myself, but I felt a kinship with these folks because the sport has some similarities to skiing and snowboarding. Whether it’s catching a big wave when the surf’s up or shredding the gnar on a powder day, these sports feature people riding on water: salty and frothy in the case of surfing; fluffy and frozen in the case of skiing/snowboarding. 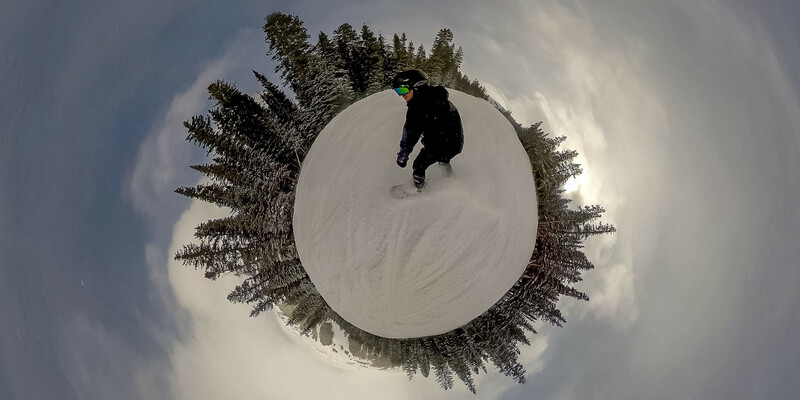 On a big powder day, snowboarding sure feels like riding a wave. In some ways, taking a spill in the ocean looks preferable to slamming onto a frozen trail while skiing or snowboarding. Then again, if you’re surfing, you do have the potential for an enormous wave to crash on top of you and slam you into the razor-sharp reefs and volcanic rock that only lie a few feet below the surface. 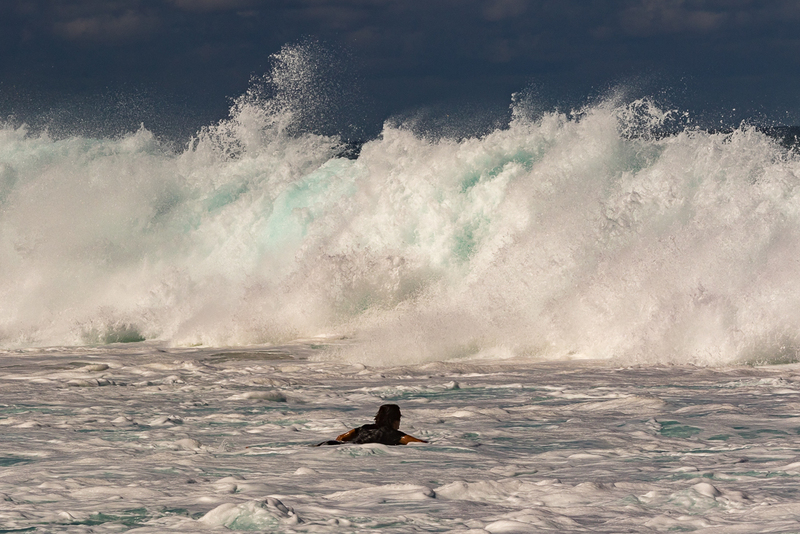 Pipeline is often considered the world’s deadliest wave. Its average wave is 9 feet (3 m), but can be larger. 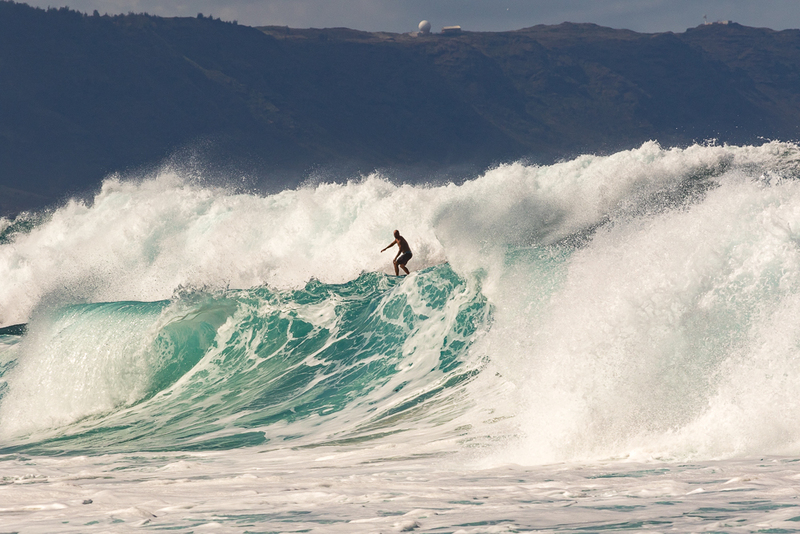 Many more people have died or been seriously injured at Pipeline than at any other surf spot. The parking situation near the pipeline was also a little crazy, but the beach was situated near some great food trucks. On both visits to the pipeline, we made sure to stop at the trucks and gorge on poke bowls with fresh tuna. As we ate under the shade of a tarp next to the truck, I admired the many covers from surfing magazines featuring the famous surfers who have visited. Just as with alpine sports, there’s a cottage industry of photographers who work the surfing circuit and there were some mighty big lenses on the beach. Standing around in flip flops and the tropical breeze may seem more appealing than waiting for some skier to huck a cliff in a blinding snow storm. Then again, that tropical breeze is laden with salty sea spray and there’s sand everywhere, so the lifespan of your photo gear must be cut short if you’re a surf photographer. Sure enough, I nearly got my camera drenched on the second day when a thunderstorm suddenly swept up the beach, catching me unawares and requiring me to sprint to the rental car to seek shelter from the storm.